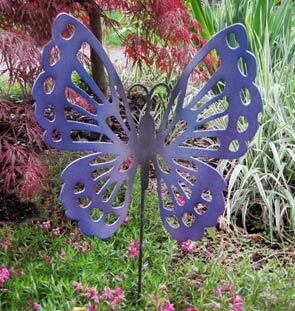 This Butterfly garden stake (12"w x 12"H) will become a favorite in any yard. This Butterfly garden stake will become a favorite in any yard. A charming way to add some elegance to your garden decor. 5/19/2014 – I love this butterfly, but need it closer to about 20" x 20" high. Do you offer one in a larger size--if so, what is the . . .